The Triticeae Toolbox (T3) is the web portal for data generated by the Triticeae Coordinated Agricultural Project (T-CAP), funded by the National Institute for Food and Agriculture (NIFA) of the United States Department of Agriculture (USDA). It also contains data from US Uniform Regional Nurseries, supported by the US Wheat and Barley Scab Initiative. The database was initially developed as The Hordeum Toolbox (THT) to hold barley data generated by the Barley CAP project (2006-2010). T3 Barley hods data generated for Hordeum vulgare L. T3 Wheat holds data generated for Triticum spp. T3 Oat holds data generated for Avena. All are being enhanced in database performance, community curation and user tools. T3 contains germplasm line information, pedigree, genotype and phenotypic data from breeding programs participating in the CAP and core germplasm collections maintained by the USDA National Small Grains Collection. The 9,000 SNP wheat iSelect assay was designed by research groups funded by the USDA National Institute of Food and Agriculture (grant CRIS0219050; PI: E. Akhunov; co-PIs: S. Chao, G. Brown-Guedira, D. See, M. Sorrells) and the Grains Research and Development Corporation (GRDC), Australia (PI: Matthew Hayden). The details of assay design can be obtained from the USDA wheat SNP development project and International Wheat SNP Working Group websites. The T3 software is available under the GNU General Public License (LICENSE) and may be downloaded from GitHub. It requires Linux, Apache, MySQL, and PHP. Details are in the INSTALL document. A list of recent changes to the T3 software are in the Change Log document. The database schema in .sql format is here. 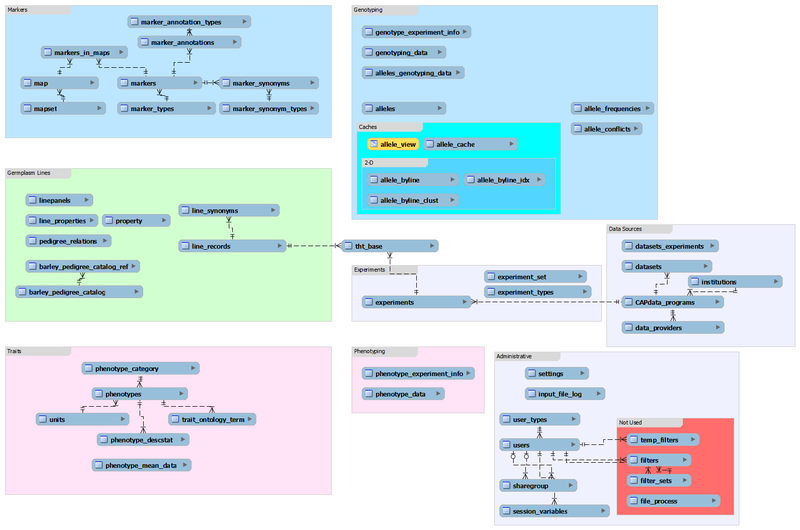 Graphical diagrams are available in MySQL Workbench (.mwb) format and .png format.